As a leading technology company, Mastercard strives to make cities safer, more vibrant, and more efficient. However, many organizations have launched efforts to build tomorrow’s cities. For Mastercard to stand out, it needed to cut through a crowded conversation—to take an already popular topic and reframe it around an angle Mastercard was uniquely positioned to own. Mastercard already had a pioneering vision: To transform how cities and the private sector work together to create change. Atlantic 57 helped Mastercard launch this important conversation. Together we created City Possible: a platform to share Mastercard’s vision of a new private-public partnership model for co-developing, piloting, and scaling urban solutions across the globe. 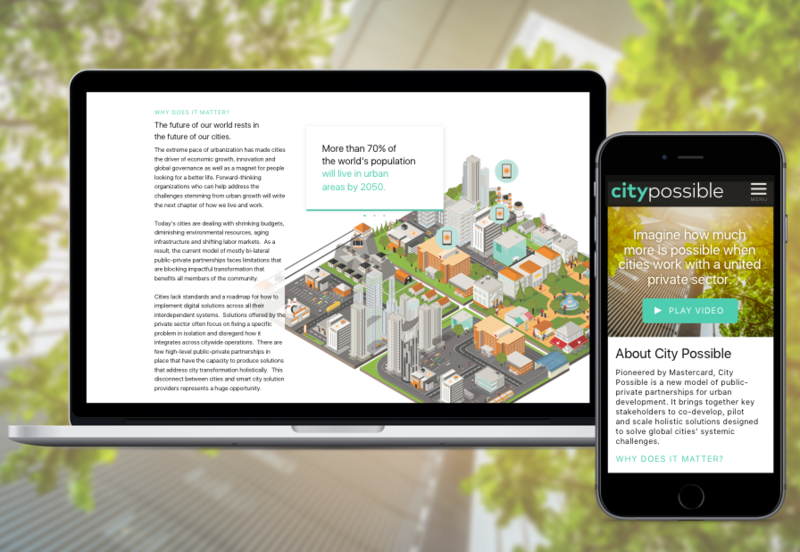 The platform uses multimedia explainer content to spotlight the challenges cities face and the ways public and private sectors can work together to benefit cities, businesses, and individuals. The website positions Mastercard as a thought leader and a partner to others who want to get involved in the shaping the future of cities.